An awe inspiring, pristine wonderland of native plants, animals, and geology is what you’ll find in Zhangjiajie National Forest Park, Hunan Province. 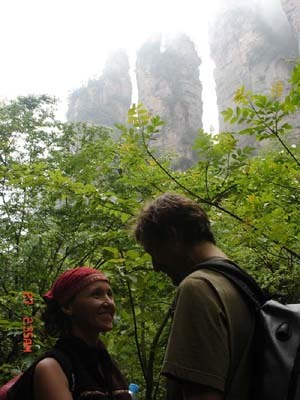 Easily accessed by ei-ther rail, road, or air, Zhangjiajie is rarely visited by the adventurous eco-traveler. While the most famous scenic sites are crowded with throngs of Chinese and Korean tourists, many well developed trails are deserted, perfect for solitary communion with the lush environment. These spur trails are so deserted as to give the feeling that their beautiful stone walkways were crafted by an ancient civilization, then lost in time until your arrival. The incredible network of stone and slated pathways are themselves an architectural and engineering marvel, inspiring our party to name them “the Great Staircase”. We ap-preciated having guide and translator Tang Ming help us get oriented. He lead us be-yond the crowds to some very special places. He was very patient, trustworthy, did his best to answer all of our questions, and gave us comfort given that our Chinese lan-guage skills were essentially non-existent. Tang Ming shares this place with a genuine sense of pride and reverence which we enjoyed greatly. For the naturalist, whether amateur or professional, Zhangjiajie National Forest Park is sure to please: 720 plant and 149 animal species. It is said that 98% of the park is cov-ered with vegetation, and during the four days of our journey we hiked by an astounding diversity of plant life, from towering trees to the most delicate herbs to giant vines, many of which were adorned with a spectrum of flowers. The animals were not commonly seen, no doubt due to the joyful shouts of tourists, who delighted in hearing their calls echoed by the deep rock canyons. Still, we without leaving the improved trails we were able to observe rhesus monkeys, squirrels, and most memorably, a 4 foot salamander caught from the Golden Whip Stream by local people to show the tourists. No doubt an exploration to even more remote recesses of the park could improve the chance of other animal encounters. The weather in late April was colder than we expected, and we found ourselves remov-ing and then donning various layers of clothing to stay comfortable, depending on if we were hiking or resting. This was a good season for seeing many of the local plants in flower, and the rainy mists were a spectacle to behold, yet next time we visit, it will be in warmer months,and we’ll come prepared to sleep under the stars. Alongside the busy trails are local people selling a variety of foodstuffs and handicrafts. Plant collecting within the park is officially forbidden, but this situation seems to be rarely enforced, as many hawkers stalls are stocked with medicinal roots, mushrooms, fruit, and other plant materials. Our guide Tang Ming facilitated our inquires about the plants’ various uses. This important connection of local people to their environment needs to be encouraged, while ensuring sustainability through proper harvesting proto-cols. We observed fresh ginseng root for sale, which is critically endangered in the wild and should not be purchased from these collectors as it contributes to its demise. Day2: Yaozizhai,(prepare some food, water and fruits for your picnic) after breakfast, walk 1.35 km from Pipaxi hotel to the entrance, starting point to Yaozizhai is Laomuwang ,walk 2300 km to the top of the mountain, take a big loop around the mountain for 2 hours, in the afternoon go to the other side of the mountain eagle’s beak and natural arch,explore for 2 hours, then walk down the mountain the same way back, stay in Pipaxi hotel overnight, prepare for next 2days stay in the mountain,left your unnecessary stuff in the hotel. Day3: Golden whip stream and Yuanjiajie (prepare some food, water, and fruits for your picnic), after breakfast, take your needed luggage; start to walk in the golden whip stream for 1.5 hours to the snack house, you walk across the bridge, take a quiet trail along the Shadaogou valley, it will take you 3 hours to get to the top of Yuanjiajie, Wangqiaotai is the first scenic spot in the top,you stop park bus to Tianxiatiyiqiao-First Natural Arch,check in a hostel, the first natural arch is the finale scenic spot of your day. Day4: Yangjiajie, after breakfast, take park bus to Wulongzhai,full day exploration in Tianbofu,Balipo,Yibudongtian- one step to heaven ,Kongzhongzoulang-corridor in the air, Stay overnight in Wulongzhai hostel. Day5: Tianzishan, after breakfast, take park bus to Tianzishan, do sightseeing in Shen-tangwan,Helong park,Yubifeng,after finishing sightsee-ing on the top of the Tianzishan mountain, begin to take a trail downward the mountain from the Tianzi pagoda, you go through Yueliangya ,Wologling lying dragon ridge , Shilihualang ten-li picturesque gallery ,finally you come to mini train station, and take park bus to Wulingyuan entrance and take a car back to your hotel. Day6: free in the morning, in the afternoon go down town to do city tour and visit sand stone painting museum, and say good-bye to Zhangjiajie at the airport. ・Laundry, phone calls, medical expenses, cab fare for personal use and other personal expenses.